Healthcare systems contend fiercely with their competitors for qualified professionals to fill their executive positions. Because senior leadership vacancies can be crippling, health systems must employ the right people to meld with the organization’s leadership team and to fit in culturally. At Coker, primarily a national healthcare advisory firm, we offer organizations search services to identify capable candidates with suitable experience and cultural compatibility. Tailored recruiting and placement of senior-level executives and middle management candidates within health systems goes hand-in-hand with professional and operational advisory services to meet the unique requirements and strategic challenges for a vacant role. Finding the right candidate who is well-suited to the organization is a top priority in our executive search services. Top-level talent searches should encompass building a pipeline of high-potential candidates that includes members of your existing staff as well as outside hires from the healthcare industry. With appropriate grooming of insiders and ongoing contact with outside talent, your organization will be ready when openings occur, whether planned, such as in retirement, or unexpected. Beyond the search and hiring aspects, adding a new member to the executive team requires the candidate to understand the leadership dynamics and discern the organizational philosophy of the prospective employer. The precise alignment between the two perspectives drives high-performing teams and organizations. Our executive search approach involves leadership assessment to compare the traits of the potential new hire with the executive team. 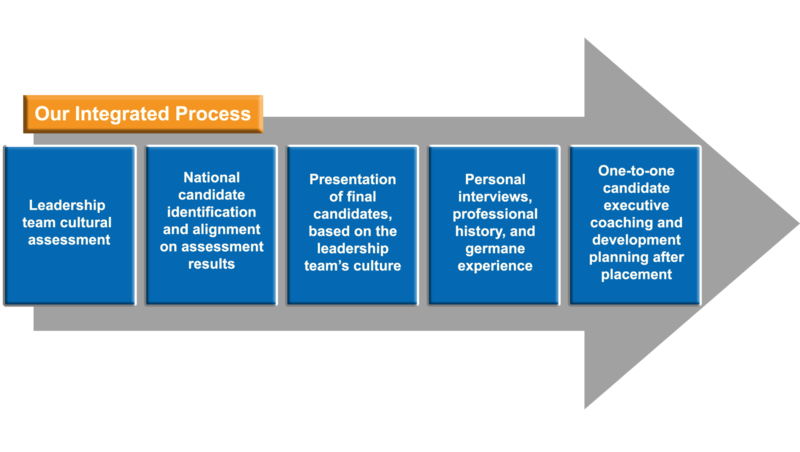 This process, when coupled with feedback from personal interviews and professional experience, provides meaningful insight for all involved. Leadership development, a natural outgrowth of search and placement, calls for a customized approach and offers boundless opportunities for growth. One-size-fits-all programs are limited in scope and are rarely beneficial. We create executive leadership development programs with standard features, such as 360-degree evaluations and individual assessment instruments, e.g., DISC, Emotional Intelligence Inventory (EQI), and the Meyers-Briggs Type Indicator (MBTI), plus others. Leadership coaching and team facilitation are the core of our leadership development consulting services. The real power of teamwork is the ability to achieve far more than an individual could do alone. Able leadership working together at all levels maximizes an organization’s potential for success.